This dresser base consists of a solid oak plank top leading down to the front which consists of two long drawers with a bank of four shorter drawers to the centre with a cupboard either side. 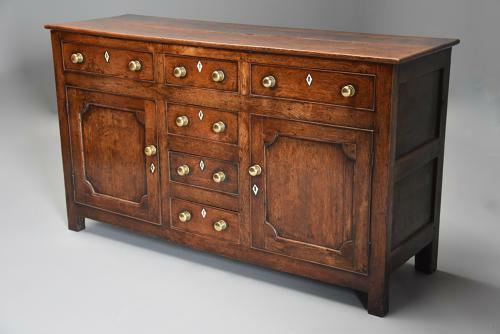 The cockbeaded drawers have superb quality 18th century style solid brass knob handles (not original) with a steel pin to the centre with diamond shaped escutcheons, the drawers being pine lined. The cupboard doors are panelled with shaped quadrant moulded decoration to the corners also with solid brass knob handles and diamond shaped escutcheons, each cupboard having an interior shelf. The dresser has panelled ends which is a nice feature and terminates on stile feet. This piece is in very good condition for age, is of stable construction and can go straight into a home.